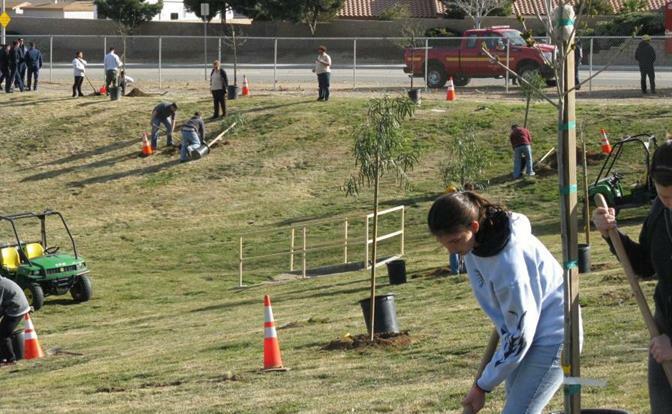 PALMDALE – The City of Palmdale will kick off its “Season of Service” program with a “Desert Reveal” cleanup on Saturday, Jan. 25 from 8:30 am to noon at Avenue S and 70th Street East in Palmdale. The project is part of the City’s participation in the “National Day of Service” in recognition of Jan. 20 being Dr. Martin Luther King Jr. Day. Volunteers clean planes at Joe Davies Airpark. Volunteers under age 16 must be accompanied by an adult. All participants must complete a Release of Liability (available at www.cityofpalmdale.org or at event registration). Participants are requested to wear closed-toe shoes and be prepared/able to walk over uneven terrain. Participants must also use work gloves and sun protection. Water will be provided. Verification of service hours is available. Work side by side with City staff and neighbors to install the infrastructure of the new community garden. Help prepare this amazing park for a summer of visitors. Work side by side with friends and neighbors among real-life examples of our rich aviation history. Participants must be age 12 or older for this event. Youth, families and the young at heart are invited to participate in a park beautification at one of Palmdale’s most beloved parks. Sponsored by the Church of Jesus Christ of Latter Day Saints, join residents in a makeover of this neighborhood jewel. “We encourage residents to participate in one or all of these opportunities to help make Palmdale an even better place to call home,” Jones stated. For more information on Palmdale’s Season of Service program, call 661-267-5181. 1 comment for "‘Season of Service’ to kick off with desert cleanup"
These are good projects for adults and the youth. East Avenue S and 70th Street East do need to be cleaned up, especially the areas between Pete Knight High School and the Quaries nearby.